Today we have been having sensory fun with potato flakes. I had never actually touched potato flakes before today. I have never really understood the need to make a potato more simple to prepare so have never used the flakes in cooking, however I was inspired by a post I saw on How to be Awesome at Everything’s blog. 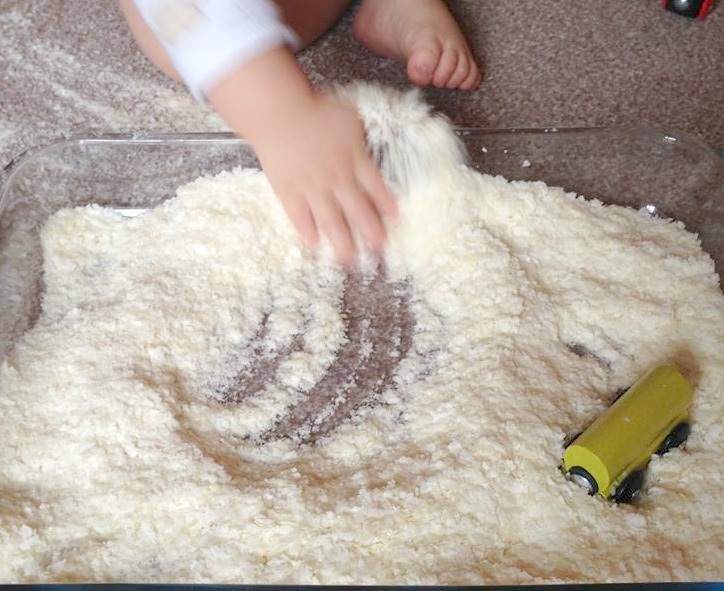 You can check it out here – Sensory Play Mashed Potato Flakes. We have been working on scooping a lot lately so I decided to give Buddy a break from that today. Instead I set up a Snowy Train invitation to play. Buddy squealed in delight as he pushed the train through the snow and he even practised burying it. 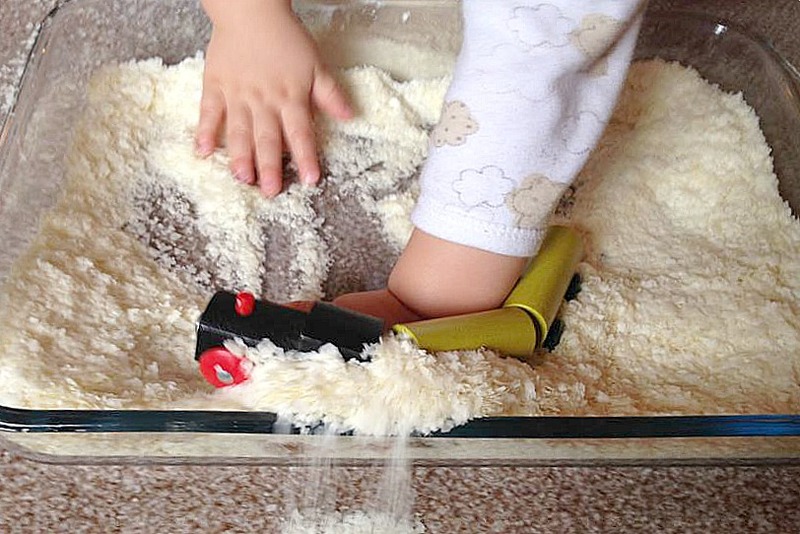 He was fascinated by the texture of the potato flakes and constantly ran it between his fingers and rubbed it between his palms which made it look like it was snowing! 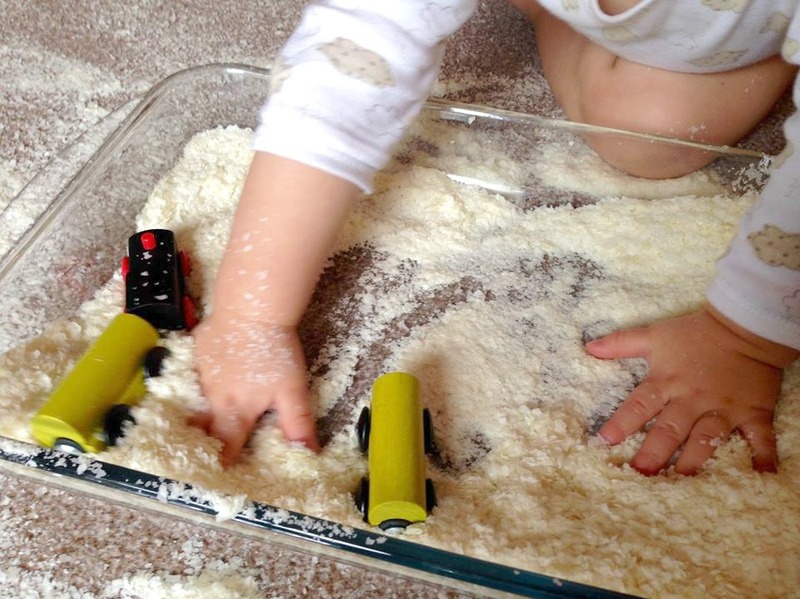 He loved pushing his train through the potato flakes and making tracks in the snow. Unfortunately, my carpet also took a big hit whilst he was doing this! Of course, we all know that a sensory bin has not been explored thoroughly until someone has sat in it! Fortunately, Buddy was more than happy to oblige! This was a really fun activity, and BREAKING NEWS…… for the first time ever, Buddy didn’t even try to taste it! This is huge progress for us as you will know if you have been following us! If you’re new, well this kid would eat rocks if I let him. Buddy was particularly fractious today (the joys of teething), but this play still amused him for around forty minutes. I do plan on building on it in the near future by incorporating a Rainbow theme so stay tuned! 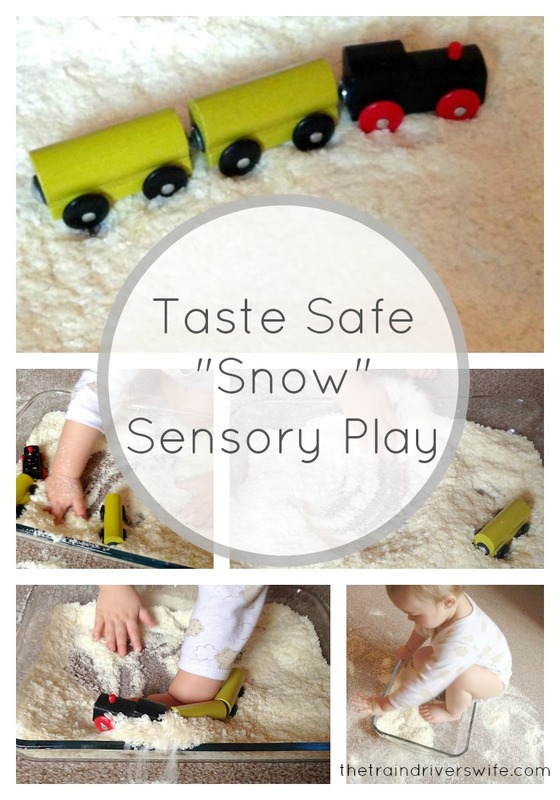 If you enjoyed this play, you may also enjoy our Taste Safe Sand Play or our Flour Sensory Play. 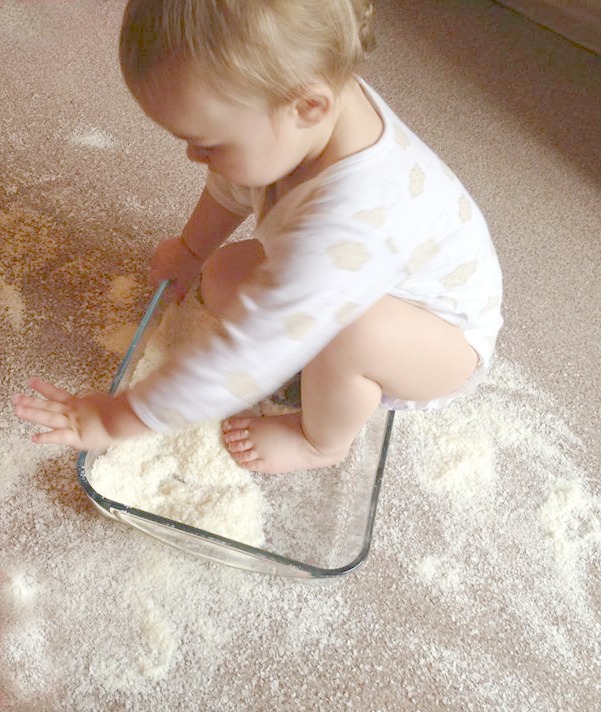 Alternatively, if you have come here looking for taste safe play ideas, why not check out our 30 Taste Sensory Bins for Babies and Toddlers or our 30 Taste Safe Doughs for Babies and Toddlers. Thanks for stopping by. Please feel free to leave me a comment, I love reading them! And remember, you dont have to miss a single post. Just sign up to follow the blog by email on the right sidebar. Haha Buddy loves sitting in his bins! They are just so suoer cute at this age!